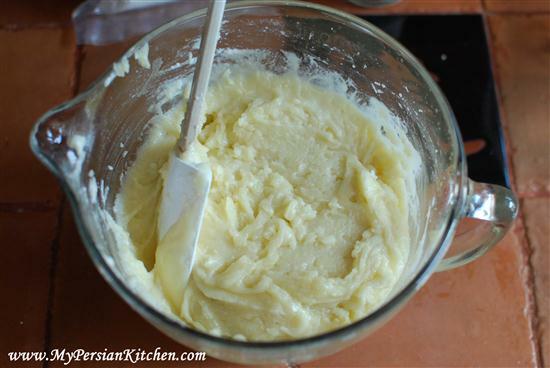 Baking cookies is a big part of the days leading up to the Persian New Year. I am really excited to share this recipe with you for a couple of reasons. One because Naan Berenji is one of my favorite Norouz cookies, but also because of the person who gave me this recipe. This cookie is really simple to make and this recipes make a lot of cookies. Not only is it easy, it’s also gluten free and dairy free! If I were a better blogger, I should have counted them all and told you. But I didn’t because I baked a tray on Friday morning and took pictures. Then yesterday we baked a couple of trays at the Persian cooking class that I taught and enjoyed them with some Persian Tea after we ate the delicious food that we cooked. Now to the part of where this recipe comes from. I should begin by saying that I have a love and hate relationship with Facebook simply because it can be somewhat of a passive way of staying in touch. For me it has been a great way to reconnect with family and friends who don’t live in LA or in the US. Anyway, one fine day I get an email through FB asking me if I was so and so’s daughter. Our common “friends” were my paternal cousins. A couple of emails exchanges later I found out that he is a second cousin and so we have been getting to know each other. His name is Sjarog and I affectionately call him Cousin Sjarog. Cousin Sjarog lives in Amsterdam and for the past few months has been actively cooking Persian food and posting his creation’s pictures on Facebook. And I have been loving every second of it!! A couple of weeks ago I asked my cousins if they had a good recipe of Naan Berenji and I immediately received an email with the recipe from guess who? Cousin Sjarog!!! He found this recipe on the internet when he was looking for it himself and passed it on to me. I have included the converted amounts into cups for those of you who don’t have a scale! Separate eggs and set egg whites aside. 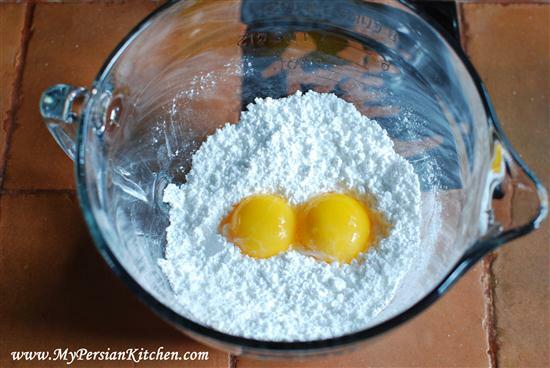 In a bowl place confectioner sugar and egg yolks. I would suggest sifting your sugar; it didn’t occur to me that I should have done that until it was too late. 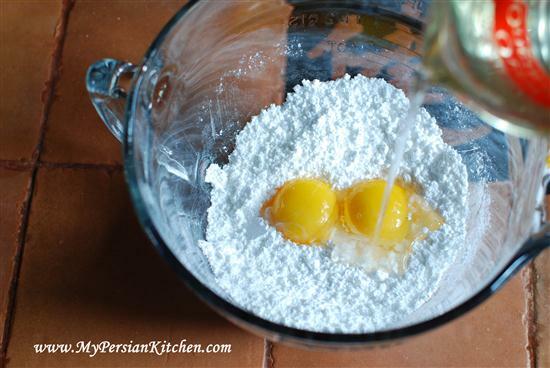 Add oil to sugar and yolks and mix well. Beat egg white in another bowl until firm. Add rose water and rice flour to the eggs, sugar and oil. Mix well. Let the dough rest over night in the fridge. I found that the best way to make these cookies was to shape them into a small ball the size of a hazelnut. Please them on a cookie sheet lined with parchment paper. The gently press them down into a round form. Then take a fork and create indentations on each cookie. It is best to do this when the dough is nice and cold so that the fork doesn’t stick to the dough. 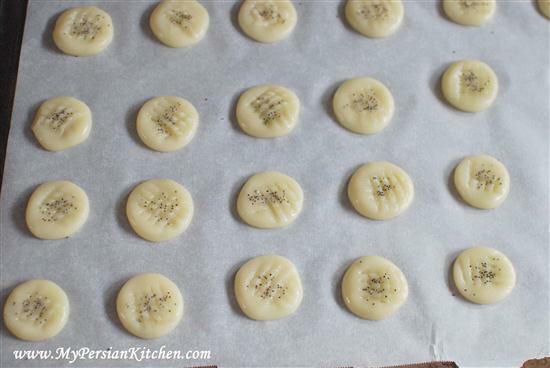 Then sprinkle some poppy seeds on each cookie and bake for 25 minutes in a 300º oven. 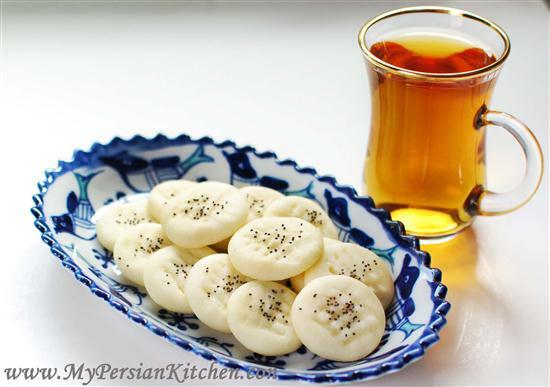 Enjoy these cookies with a nice cup of Persian Tea!! The cookies look so delicate and delicious. Is there a substitution for rose water? I really do not care for the perfume taste rose water gives the recipes. Marie, you could substitute with ground cardamom if you like. If neither are appealing to you then, I could go with vanilla extract. That sounds delish. Never tried rice flour cookie. Just wondering if I can substitute egg with something vegetarian and can I use brown rice flour instead of white rice? I am so excited about this recipe! I just bought a bottle of rose water yesterday and had no idea what to do with it. I’ll be making these this week! One question, where does one usually find rice flour? Dear niece sanam jan,I realy appreciate the words you had about me,I also thank you because you are the reason for my comeback to my kitchen to wash the dishes of yesterday and the day before,so one way or another I am changing and to make it better I want to learn cooking in the right way, so you know you have done a lot for me, if I can do a little for you I will do that seriously, you remember Samad Behrangi ? he said :a night-worm is so tiny we cant see that at day but at night it gives a green light, a tiny green light but its also a light.As I told you I am proud of MPK,thank you so mnch. Amanda, check your local Middle Eastern store or they even might have it at Whole Foods Market. Hi, I always enjoy your page. I’ve tried many of your recipes. I mostly appreciate you because you remind me of the things I know how to cook but never think of cooking. Now, I do. Today I tried the naan berenji recipe. The oil didn’t incorporate well with the ingredients. It just sat on top. I’m waiting for it to cool off in the refrigerator. I’ll see if it bakes okay. Minou, thank you for your kind words!! Mine initially didn’t incorporate all that well either until I added the flour and folded in the egg whites. Let me know how it comes out!! Yum, I am sooooo making these. Have loved them forever; thanks for sharing the recipe. Gluten free and dairy free is a huge bonus for me, and I’m sure for many others as well. Thank you for people like to keep persian culture alive. Happy Nowrouz! What kind of oil I should use? (I usually use extra virgin olive oil almost for everything.) can I use olive oil? Julia, I used canola oil. Other options would be vegetable oil or some also use corn oil. But I wouldn’t use olive oil! @ Julia, mine was on the think side. How did yours come out? I ended up adding so much more rice flour and even starch but it stayed thin anyways. Eventually I had to spoon out the dough into the tray but it just stayed liked that in the tray and it ended up yummy. I used glutenless rice flour so not sure if that was the reason?! But I also noticed my rose water 1&1, somehow thins out things so fast. 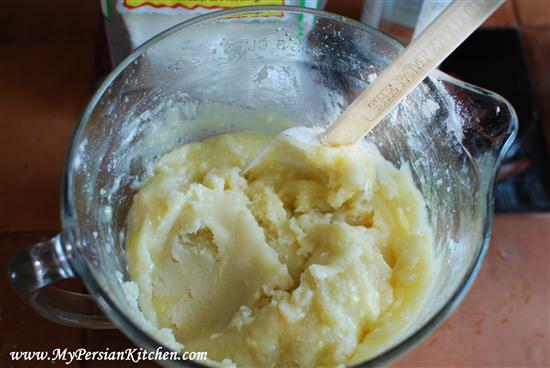 I noticed my dough loosen up as soon as I added golaab. But it was yummy anyways, thank you. Julia, I wish I could give you an informed answer when it comes to baking questions. But I am not an expert baker!!! In the end though, I am so happy that the results came out YUMMY!!! I made these cookies this weekend and I too experienced cake-like batter instead of a dough. They tasted good, but didn’t come out as pretty as yours. I think mine were thinned out when I encorporated the egg whites. I just made the naan berenji dough,it’s so thin I left it in refrigrator to rest over night,if it comes out thin again can I add more rice flour,and if I do does it need to rest again?Thank you for the recipe anyway. 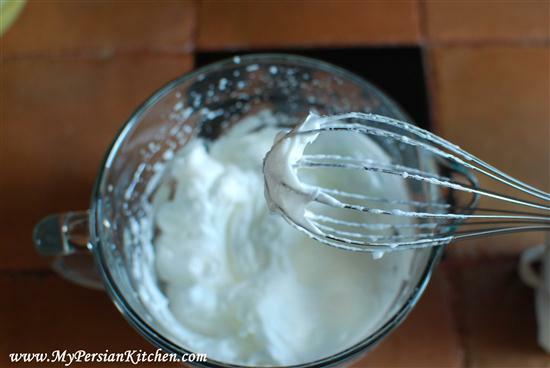 Is it ok to use almond powder,instead of slivered almond for persian tut. Hi guys, I made these cookies last weekend too, after reading the recipe, and having all the ingredients on hand, I decided to give it a go, even though I’d never even tried these cookies before. Mine too, came out runny and cake-like. I baked the first batch like this (they tasted just fine) although I knew they weren’t the right consistency after reading about them. Here’s where the mistake seems to be. The very first ingredient, the rice flour. The conversion is not correct. 500 grams seems to be equivalent to about 4 cups of flour, and not 2! After my dough had been refrigerated overnight & I realized this, I added in another 2 cups of rice flour, which helped with the consistency. Makes sense, especially since the next ingredient, the powdered sugar, is noted at 200g = 2 cups, although really the conversion would be equal to about 1 3/4 cups. Converting grams to cups is difficult, as one is a measurement of weight, and one is a measurement of volume, so it depends on what you’re measuring. I brought the cookies to a Persian New Year party & they were well praised, despite the learning curve in making them. This recipe makes a lot of cookies, as I still have batter left over. Might want to half the recipe. @ Melissa, I suppose you can use almond flour or meal. The color might be a bit different though because slivered almonds are skinless. My Naan Berenji is in the oven now, smells so good, I’ll tell u my feedback when they are ready, but honestly I let them rest 4 only 30 minutes in the fridge, I cudn’t wait 2 try a persian recipe. By the way I’m Egyptian girl, living in Egypt but I am in love with the persian culture and I want 2 visit Iran 1 day. Just wanted to say Thank you for the recipe. I made it twice since then and always yummy. Thank you so much for this recipe! 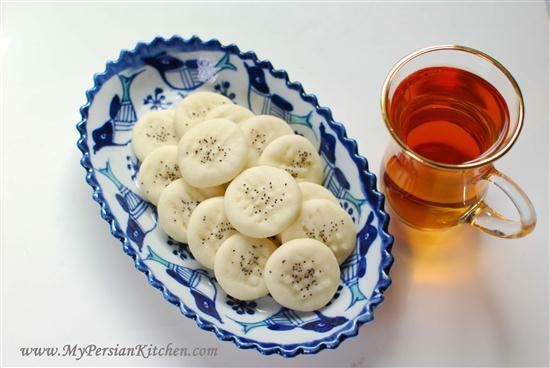 I just got a package of rice flour and went online to find a recipe of rice cookies – I’ve tried them last Norouz and liked them very much (as well as their pea – nohot – cookies). 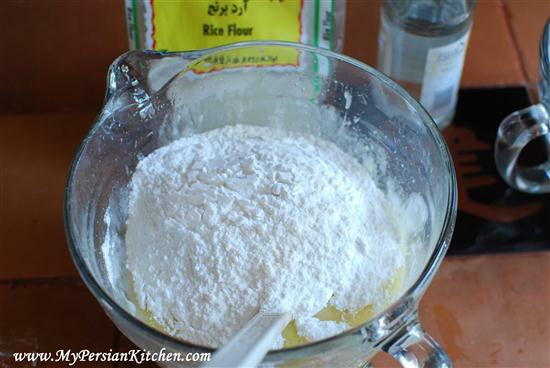 So, I gonna entertain my persian husband tomorrow with some nice rice cookies ;). Btw, I was always interested – is it possible to make rose water from pure attar of roses [essential oil]? Or it would be too much concentrated? I made the “naan Berenji” with my granddaughter, but I find them kind of “dry”, they tasted good. Is there a way to make them smooter? Susan, interesting enough, they should be dry and flakey. I suppose you can bake them for a lesser time in order to make them smoother. 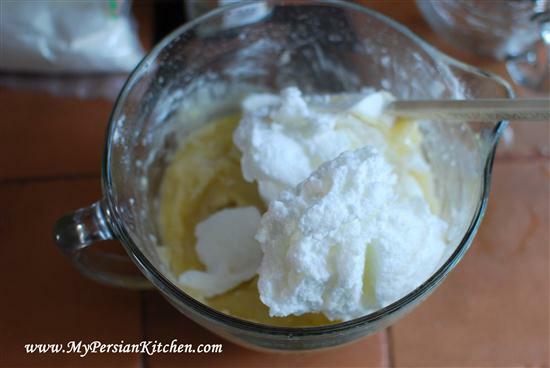 I am from Kermanshah and I know that in Kermanshah they used to use roghan kermanshahi which is actually made from butter, to make rice cookies, so is it all right to use butter or margerine instead of oil?? I baked them today. The oil mesurement seems a bit more. Mine came out very big and very oily. Any idea why? But rice flour and sugar are both dry ingredients and so 2 Cups of one at 200g cannot equal 500g of rice flour to be 2 cups as well. I bake a lot of gluten free items and very often convert things..but dry will be to dry to balance to the wet ingredients. Also the oil is 250 g but is less than not more than 2 cups which in my experience in baking is the same. 1 Cup of oil is measured in same cup as 1 cup of flour so if 200g is 2 cups how can 250 be only 1 1/4? All the additional flour did cause some cracking but I used powdered sugar and it covered it up and gave to all of my neighbors who loved them. you are absolutely right. I have updated the recipe so that it does not show the cup amounts but the original amounts in grams which is the best way to make these. Thank all for your feedback! I love these cookies very much, sombody who loved very much in early life was making them for me and I loved them so much. Ido’nt know how to make them . Here in Stockholm, SWEDEN, my wife buys them from the supermarket close to our house.I love also zabon. I just tried making these for the first time – the dough is now resting in the fridge. I did have a couple of questions though – when I added the egg whites my mixture was really dry and didn’t come together at all. I added an extra egg white, so 3 in total – was this right? Also, my mixture is REALLY oily! I used sunflower oil as I usually use this in cooking when a recipe calls for oil. Should the mixture be this oily? I thought my eggs might have been a little small, hence adding the extra one to try and obtain the dough consistency I saw in your photos! But maybe only needed a little bit of the last one to make up the right amount! Can I ask what type of oil you use in your baking? I really had no idea what type to use so went for what I have used before when baking cakes! Hilary, when baking I have always used vegetable oil. 3. Rose water is better to be 1.4 cup or even less, like 2,3 tablespoons. I will try it this way and post about the results. You don’t understand how excited I am to get this recipe! My grandmother used to make these alllll the time, because she didn’t have a cookbook (that any of us grandchildren know of), we’ve been trying to figure out how to make it ourselves. None of the bakeries around town seem to have them down right. It’s Melissa again ,Thank you again for the recipe,I’ve been making them in last two years regularly,every body loves them.I tried other recipes,I believe yours is the best ,I tried the recepie with almond flour ,came out not so good,what do you think about using coconut flour it’s more like rice flour.Please let me know what can I do to make it right with coconut flour. Thank you for the recipe, these cookies are my favourite and I couldn’t find any in Brisbane so I thought I had to make them myself for Nooruz. Melissa, I have never used coconut flour, so I have not idea. But you can try and see what happens! thank u. mpk always amazes me with unique recipes. I’m new to gluten-free, and found your recipe through the internet – so delighted to read your blog. Thank you for sharing this. Working with limited kitchen appliances, I used my cuisinart for all the steps, and all went well. The oil I used was a Persian-lime flavored olive oil because that is what I had on hand – a delicious aroma while mixing and baking, only slightly noticeable after cooling. Lacking rose water, I used distilled water and allowed the lime aroma to take the spotlight. I’m getting ready to make another batch in another kitchen with fewer appliances, so beating up the egg whites will be my challenge this time. Wish me luck! I tried the rice cookies that my friend had baked using your recipe and they were great. Would you please send me the recipe but with cups measuring.